Hi friends, are you ready for a little holiday wreath eye candy? Not only do I have a sweet little wreath for you, but there are 20 other great holiday wreaths for you to ogle over and be inspired by. I'm tickled to be joining these other talented bloggers showcasing their wreaths for the upcoming holiday. If you're not quite ready to make your holiday wreath yet, make sure to pin this so that when you are ready, you'll have 21 great ideas. You can see all the other wreaths at the bottom of this post. Needless to say, I got smarter as I got older have a deep appreciation for the love and labor that went into each of the loaves of perfectly baked bread and to this day, there is nothing that beats a piece of bread, just from the oven, slathered with real butter! Oh my. And while she baked ALL year, she really brought it at Christmas. My mom and I carried on that tradition and now my daughter and I do all the baking in our home. 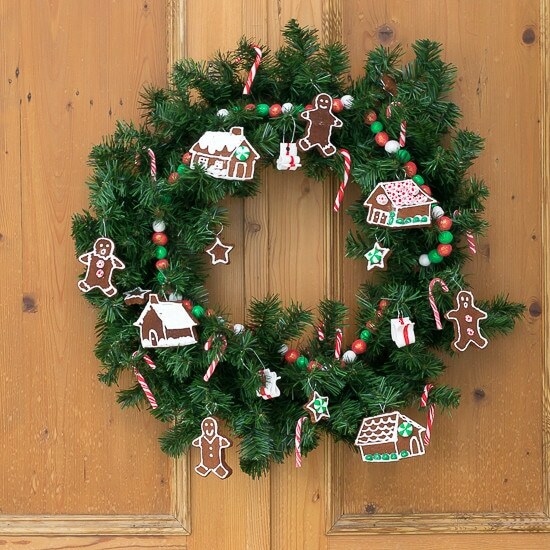 The wreath I created was inspired by our family baking tradition, with gingerbread men and gingerbread houses. With all the One Room Challenge craziness going on in my home, creating this wreath was simple bliss. And it didn't hurt that my home was redolent with the aroma of cinnamon as I baked these ‘gingerbread men' and'gingerbread house' ornaments. All my ‘candies' were easily made with sculpey clay, and a little glitter…because, well…glitter. I used a 24″ artificial wreath, as well as Sculpey Red Hot Red, Emerald and White polymer clay. The candy cane was simple and turned out so darned cute! I made the green and white ‘spearmint' candy by making equal size half moons out of both the green and white and then cutting each half moon into 4 pieces. I then pieced the 8 pieces back together to form the mint candy. Many apologies for the very lousy image, but it's the only one I have. The ribbon candy was easily made by laying a white, red and white sculpey strip next to each other, rolling it out and then trimming the sides. Fold it and punch a hole with a straw. The Gingerbread men and houses were made from applesauce and cinnamon dough. Equal parts of each with or without a little bit of white glue. I used 1 1/2 cups of each and then added about 2 tablespoons of white glue. I rolled them to about 1/3″ and then I cut out the shapes with cookie cutter. For the houses, I cut the image out of cardboard and then traced around it. Sprinkle cinnamon on your counter when rolling out your dough if it is sticky. I poked pieces of wire into the dough before I baked it to create the hooks. Outlining the gingerbread houses and gingerbread men in white puffy paint really mimicked the look of icing. I sprinkled some very fine white glitter onto the ‘icing' on the star. The making of this little wreath fit in perfectly with my day of watching football. And it's going to look perfect hanging in my kitchen this Christmas. So, are you ready to see some more wreaths for this upcoming holiday? You can easily skip through the internet looking at wreaths by clicking on the links below. Thanks for stopping by to visit today, I appreciate you more than you’ll ever know. And when you leave a comment…ah, it makes my heart sing! And, if you want to see my progress from week to week, sign up here for weekly updates. What a fantastic idea!!!! I made cinnamon dough ornaments a few years ago, but I can’t believe I didn’t think of adding them to a wreath! And those candies? out of clay?! Too cool! Thanks Ariel…so you know just how good they make your house smell, especially when they are baking! And even a week later, the wreath smells so good. Can’t wait to get it hung in my kitchen and decorate around it. Thanks again for organizing us. Hi Ellen, Thanks so much for stopping by my site! Your visit is much appreciated, as is your question. I baked mine at 200’ for approximately 2 and ½ hours, but then I turned the oven off and let them sit in there for another hour or so. I really wanted them to be hard since they would be handled a bit more than if they were hanging on a tree. Mine were approximately ¼” thick. But, having said all that…I did make some earlier that were a little thicker and ended up putting them back in the oven at 200’ for probably another hour because they seemed a little soft in the middle. I don’t think you can really ‘overbake’ them at that temp and you definitely don’t want any soft spots. And I am beyond thrilled that you were able to put together 7 boxes for Operation Christmas Child! I dropped mine off yesterday and it was such a good felling, wasn’t it? You are clearly getting into the Thanksgiving and Christmas state of mind. I hope you and your family have a wonderful holiday. And I know you’ll have a ball baking those ornaments for your grandchildren. What a very classic looking wreath. Very cute! Thanks Kristen…now I’m chomping at the bit to get the rest of the Christmas decorations out! Oh I can almost smell this beautiful, fun wreath through my screen! I love the use of the cinnamon dough ornaments! Hey Kelli…the house smelled so great while they were baking. And even a week later, the wreath makes the room smell good. Nothing beats the smell of cinnamon baking…am I right? I thought for sure that was real gingerbread. What a sweet wreath and memories! Hi Amy, that cinnamon/applesauce dough is the bomb for ornaments like these. Thanks for swinging by and hope you have a great rest of your week. Hi Lynn, Your holiday wreath is just darling. I loved the story of your grandmother and the sweet memories you have growing up in a family full of kitchen lovers. I have some of those same fond memories of my grandmother and love to carry the traditions forward with my kids. Can’t believe you made all those sweet little gingerbread men and candies. What a meaningful and precious holiday wreath. Thank you for sharing! My grandma was such a neat lady and I was blessed that she moved in and lived with us for 12 years before her death. I have such fond memories of her and when I’m baking, I’m clearly channeling her. This is precious and I love the story behind it! Aw thanks Amy…I was blessed to have a grandma like I had and she influences me still 30 years after her death. I think of her fondly. Oh this is just so sweet!! Reminds me of Christmas at home, I can’t wait to go back next month. Oh, I hope you have a wonderful trip back home for the holidays and I’m tickled that my wreath brings fond memories for you. Thanks for swinging by today Becki. I bet your wreath smells just like Christmas!!!! I am amazed that you made the ornaments from scratch. That in itself takes some talent!!! Hi Jessica…it really does smell great, even a week after I made all the ornaments. They were so very easy to make and quite a fun break from the back breaking work of the One Room Challenge, so it was a real joy. Thanks Sarah! It was a fun and very fragrant wreath to make. Now I just need to figure out the rest of my Christmas decoraitons! This is definitely a sweet wreath! I love the addition of the cinnamon dough ornaments! Just darling! Thanks Michelle, It was fun to make. A needed respite from the One Room Challenge for sure! And those ornaments smell so good! Appreciate you stopping by today. Yum! 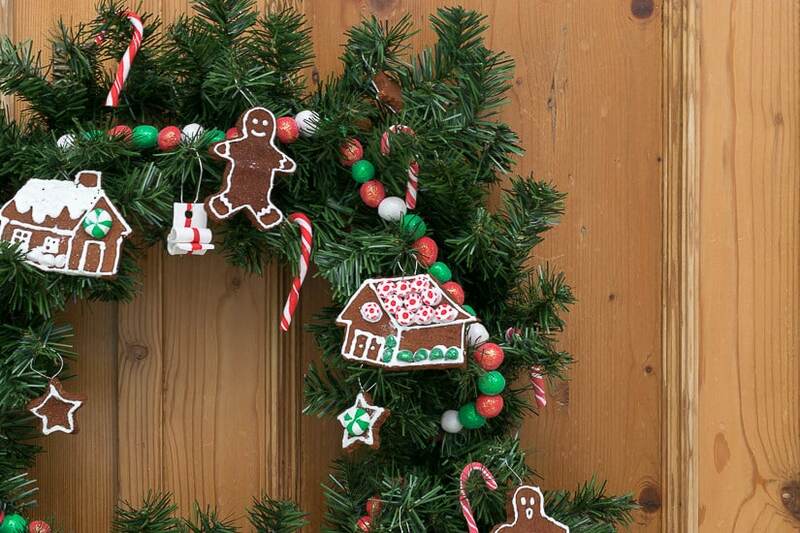 This wreath makes me crave some gingerbread! So cute! You know, some gingerbread sure does sound good about now. Hmmm…may need to do some baking this weekend. Thanks for swinging by today Rachel. Growing up my grandmother always had a gingerbread ornament tree. This wreath brings back some pleasant childhood memories…. and it smells nice too. Bonus! It’s darling and has such a warm, cozy feeling. I bet it smells amazing too! Apple sauce and cinnamon dough how knew its would be perfect for a wreath! So cute. Brings back so memories as a child. Hey Lindsay…and it still smells so good 2 weeks later! I know you would have fun making it and enjoying the aroma over the holiday. What a perfect holiday wreath! Thanks Sara! I’m glad to have one element of my Christmas decor done and now my mind is whirling on how I”m going to decorate around it! Hope you are enjoying a relaxing weekend.